Rising drone shot of moving truck and minivan driving away from a house through a neighborhood located on a mountain ridgeline. Aerial drone shot tracking along treed mountain ridgeline during spring sunset. Majestic mountain cliffside in background. Time lapse of clouds moving up and over a steep ridgeline with large mountains in the background. Waahila Mountain Ridgeline in Honolulu on the Island of Oahu, Hawaii. Flying up the coast of Waimanalo at sunset near the Ridgeline trail. 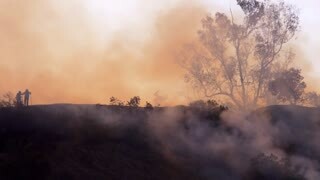 FIREFIGHTERS WALK ALONG A BURNING RIDGELINE. 4K, 10 BIT, 4:2:2. Time-lapse rolling clouds over Mt. Tantalus Ridgeline in Honolulu on the island of Oahu,Hawaii. A gently sloping snow covered ridgeline leads to a solitary peak refelcting the sunset. PAN RIGHT. Aerial- Awesome ridgeline in the Italian Dolomites. Mountaineering man. Walking up snow Ridgeline. Winter mountain backdrop, Germany. 1950s: Train drives along clear cut ridgeline. Train pulls cars of freshly sawn logs through forest. Aerial view of three hikers walking along ridgeline looking at colorful sunset reflecting in lake below.